Eliminates rod damage due to storage. Eiminates rod separation due to transportation. Ends the nuisance of elastic bands and twist ties. Doesn't scuff, mark or gouge rod surfaces. Quickens set up time and gets you fishing faster! Lessens take down time, so keeps you fishing longer. Unaffected by sun, extreme heat or cold. Two design choices - fits most fishing rods. Soft and pliable, unlike cheaper imitations. You Can't Catch Fish If Your Line Isn't In The Water! We've all been in this situation. They said you were crazy to head out at four in the morning, but you went anyway. The forecast called for a great day, but it's been raining since five with no relief in sight. Fortunately, the fish are biting like never before, so it looks as if the day won't be wasted after all. You can't wait to make that first big cast, and you will...after you've unpacked your gear, untangled your line and dug through your tackle box only to find that you forgot to bring your favourite lure. It's an angler's worst nightmare. 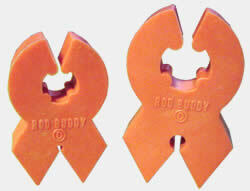 Fortunately, today there's The Rod Buddy by Maritime Innovations. 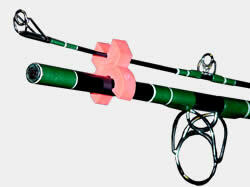 The Rod Buddy lets you clamp both parts of a two-piece fishing rod. Unlike cumbersome rubber bands, twist ties or sticky tape, The Rod Buddy consists of two soft yet firm, poly-plastic clamps that hold the rod securely. As a result, you can leave your rod rigged without having to remove the reel, line or even the lure...or have to worry about tangles, scratches, etc. The Rod Buddy is the perfect solution for any angler looking to take the hassle and frustration out of carrying, transporting, protecting and storing their expensive fishing rods. 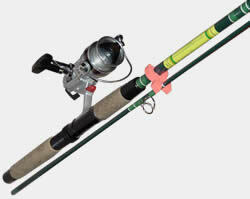 Available in two sizes, including a large rod shaft design, The Rod Buddy is a fisherman's dream come true! ( 3 Pairs Large, 3 Pairs Small ) for only $9.98 US! ONLY $2.79 SHIPPING per unit!